Here we are going to show you how to grow cucumbers vertically to get the most productive plant. 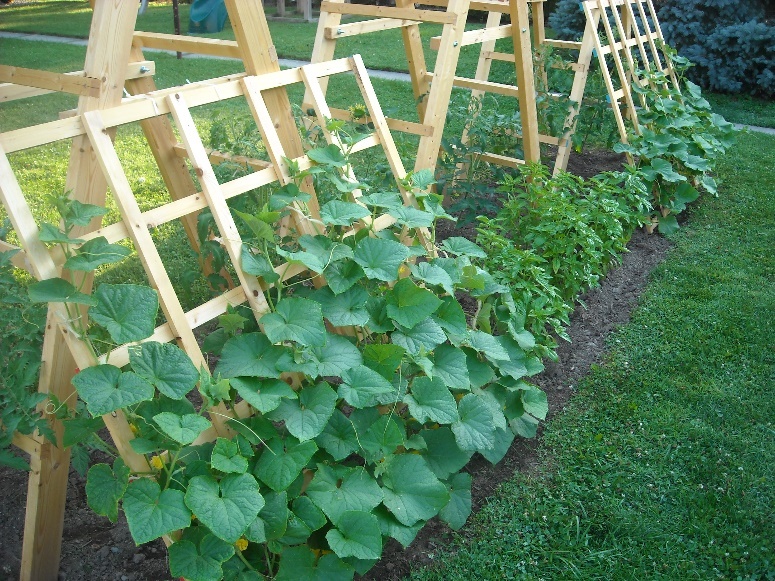 Growing cucumbers vertically also saves lot of space, which is great if you have a small garden. 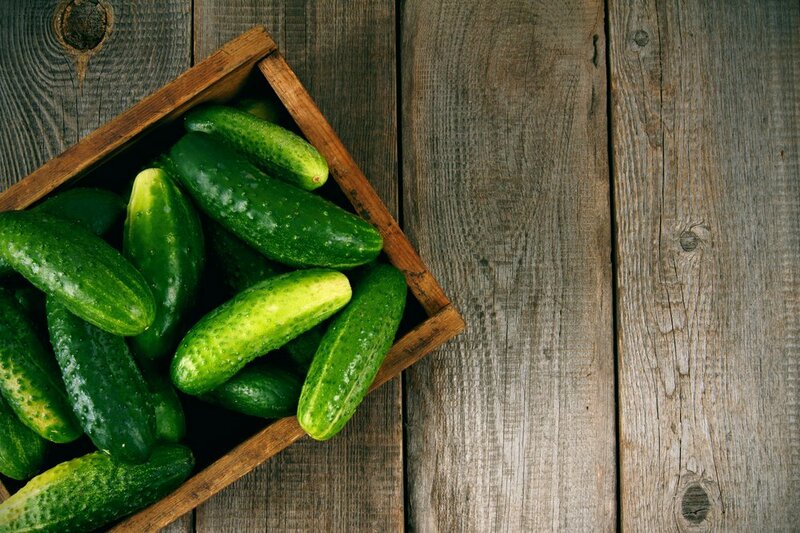 The cucumber is a refreshing vegetable, especially if picked fresh. 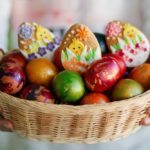 It is eaten in a variety of ways: raw in salads, cooked and pickled. It is easy to grow and only requires a warm, sunny exposure and deep regular watering. 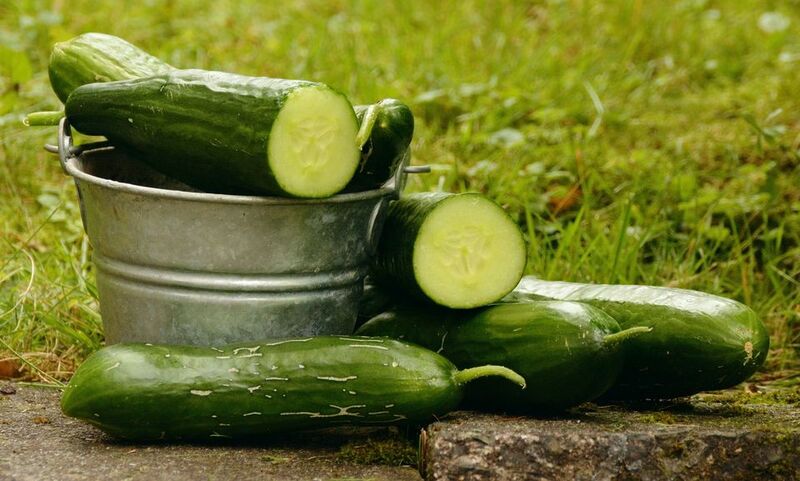 One advantage of Growing Cucumbers Vertically is that you can avoid a common problem of fruit rot associated with cucumber cultivation, which happens when the fruit sits in moist soil for long period of time. When you allow cucumber vines to grow up vertically, it improves the air circulation around the plant, and that prevents fungal diseases. 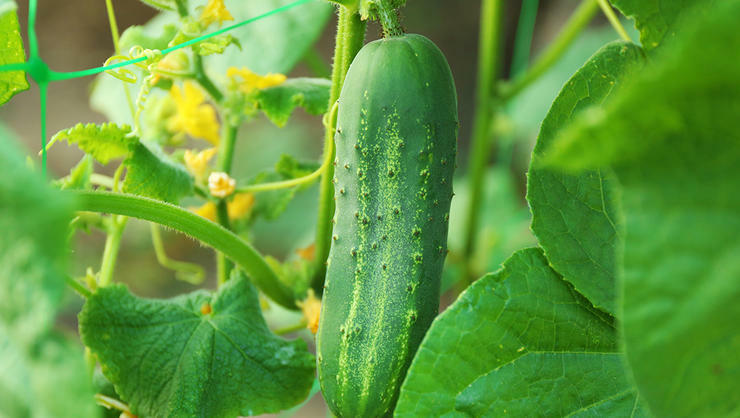 Cucumber plants also have a sprawling habit and growing cucumbers vertically allows their leaves to absorb more sun, which results in a healthy plant and large cucumbers. 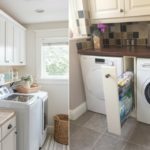 One more key benefit is that you can harvest the fruits more easily and in time. When cucumbers grown horizontally they usually cover 10 – 20 sq ft of space, plant sprawls over the surface around it. However, smaller and bushier varieties take only 1/3 of this space but they produce less fruits. Climbing, vine type varieties are more productive and when you grow them vertically they barely take 1 sq ft of space, climbing up on the support of trellis. If you’re growing cucumbers vertically in containers, choose large containers that are about at least 30 cm deep and wide. 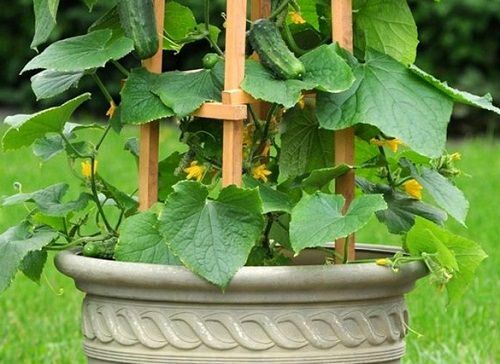 How many cucumber plants you can grow in such a container depends on the variety you are planting. A vining variety grows tall and send long roots, whereas bushier varieties are short. 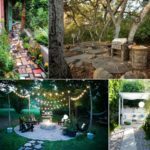 Choose a 1.5 to 2m tall trellis that is sturdy and doesn’t topple. 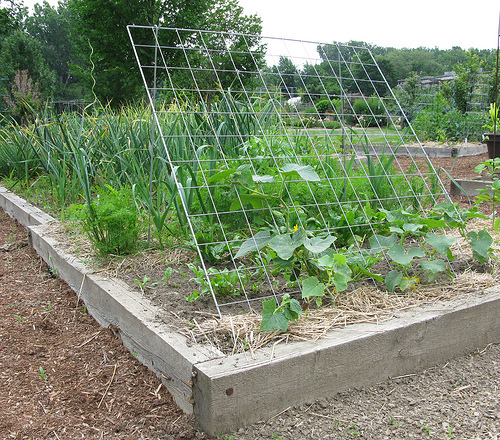 If growing climbing varieties use “A frame trellis” so that the plant crawl up and down from it easily. 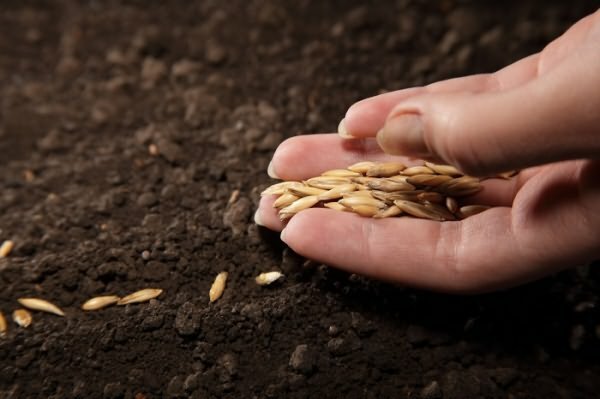 Sow seeds directly onto the desired spot or in small pots. Cover them with about 2 cm of soil. Once the seedlings germinate and have a few leaves, transplant the healthiest ones into a bigger pot or on the frost free ground in spring or summer when soil temperature is around 70 F (20 C). If you live in tropical or subtropical climate, you can grow cucumber year round. The cucumber plant is a heavy feeder like tomatoes, prepare your soil well before planting by incorporating decomposed manure and compost. Cucumber loves a warm and sunny exposure that is less windy. 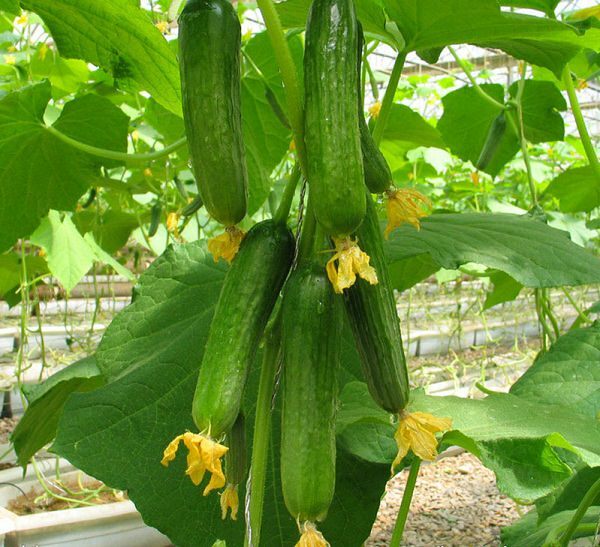 It does not tolerate temperature below 10 C. Optimum temperature to grow cucumbers fall in the range of 15 – 35C. 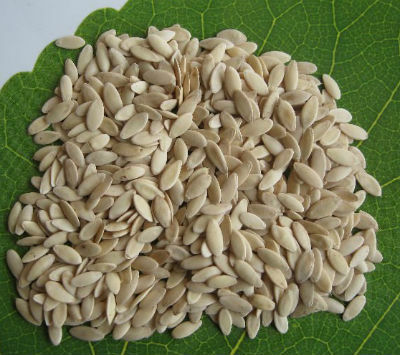 It prefers well drained, loose and deep soil, rich in organic matter and neutral in pH. Regular and deep watering is the key of productive harvest, when growing cucumbers. It is due to the high water content of its fruit. While watering, avoid wetting the foliage as it may encourage fungal diseases. Mulch around the base of plant to improve moisture retaining ability of soil. At the time of planting add all purpose slow release fertilizer in soil. Once the plant starts to flower, side dress the plant with aged manure. Also apply balanced liquid fertilizer at that time according to manufacturer’s instructions. Cucumber plants particularly suffer from anthracnose, powdery mildew and in pests look out for aphids. 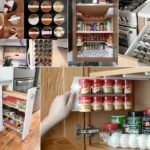 When and how to harvest cucumbers?